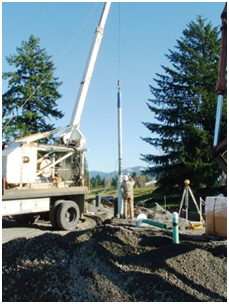 Project Description: The City of Mill City historically drew its municipal water supply from the North Santiam River. Periodically winter storms would raise river turbidity levels so high that the existing water treatment plant had difficulty adequately treating the water. In addition, the City had concerns about the potential for a trucking accident on Highway 22 causing contamination in the river. Based on these concerns Westech Engineering assisted the City in addressing water rights issues to allow the City to develop water supply wells for its municipal needs. Westech then assisted the City with well siting and plans and specifications for drilling two new municipal wells, new well pumping equipment, chemical feed equipment, and new well buildings. Westech also provided bidding and construction services for these improvements.